Should security pros get special H-1B visa consideration? Insiders praise administration's focus on infrastructure and deregulation, but worries linger over immigration policies. At the outset of the Trump presidency, there is considerable uncertainty around what the new administration might mean for tech policy, a deeply complex set of issues that were largely out of view on the campaign trail. As a candidate, Trump did not articulate a tech policy agenda, though he stressed the need for a tougher posture on cybersecurity. Now in the Oval Office, Trump has a range of areas where he could advance polices that impact the tech sector, from immigration to privacy to curbing regulations on emerging technologies such as drones and health IT applications. One area where many tech insiders see the potential for advancing longstanding goals of promoting smart-grid technology and high-speed broadband deployments is in the massive infrastructure package that Trump has called for. Much of that proposed $1 trillion undertaking would focus on physical infrastructure like roads and bridges, but it is critical that policymakers include strong provisions bolstering the technology build-outs that will support future job growth, argues Karen Kornbluh, a veteran of the Bill Clinton and Barack Obama administrations who currently serves as Nielsen's executive vice president of external affairs. "We can't think that the way we're going to renew the American economy is to go backwards. We need to make sure that we've got a smart grid. We've got to make sure that we have broadband to all rural communities at an affordable way," Kornbluh said this week at a policy session at the SXSW conference in Austin, Texas. "So I think one of the things that we should all focus on is making sure that if there is an infrastructure package, that it really has a very good 21st century infrastructure component of both energy and broadband," she said. While the White House and lawmakers are currently engaged in efforts to overhaul the healthcare system, members of Congress have begun mapping out proposals for how a legislative package might take shape. Ajit Pai, acting chairman of the FCC, addressed the issue on Wednesday at a speech at Carnegie Mellon University in Pittsburgh, making plain his views on the issue. "[M]y position is clear: If Congress moves forward with a major infrastructure package, broadband should be included," Pai said in prepared remarks provided by the FCC. Pai also argued that any funding that lawmakers appropriate for broadband deployment should be administered through the FCC's Universal Service Fund, in contrast to Obama's 2009 stimulus bill that allocated funding for broadband deployments to the departments of commerce and agriculture. "[O]ur track record is frankly better than that of other agencies," Pai said, citing reports of duplicative or ineffective broadband initiatives undertaken through the 2009 law. Policies to spur broadband deployment and encourage greater consumer adoption, though they vary considerably in their details such as how funding should be orchestrated, are not broadly controversial. Apart from any major infrastructure program, however, a number of other policy questions of great consequence to technology firms are under discussion. The Trump administration's sweeping push to slash regulations and pare down the size and reach of the federal bureaucracy comes as a hopeful sign for advocates who argue that government rules have slowed the deployment of innovative technologies and their attendant benefits. At the SXSW conference, Jesse Blumenthal, manager of the technology and innovation program at the Charles Koch Institute, cited the case of Zipline, a Bay Area startup that's planning to use drones to deliver medical items such as blood or vaccinations to rural areas. The company tests it devices in the United States, but is planning to put the program in action later this year in Rwanda. Federal Aviation Administration regulations bar the firm from using its drones in the United States, according to Blumenthal. "That's available in rural Rwanda and it's not available in rural Texas," Blumenthal said, making a broader point about U.S. regulations curbing the use of innovative new devices and applications. "What you find are legal and regulatory frameworks that often as not didn't envision technology," he said. Though many in the tech sector applaud the deregulatory bent of the new administration, they are wary of Trump's actions on immigration, one of the signature issues of the president's political rise. 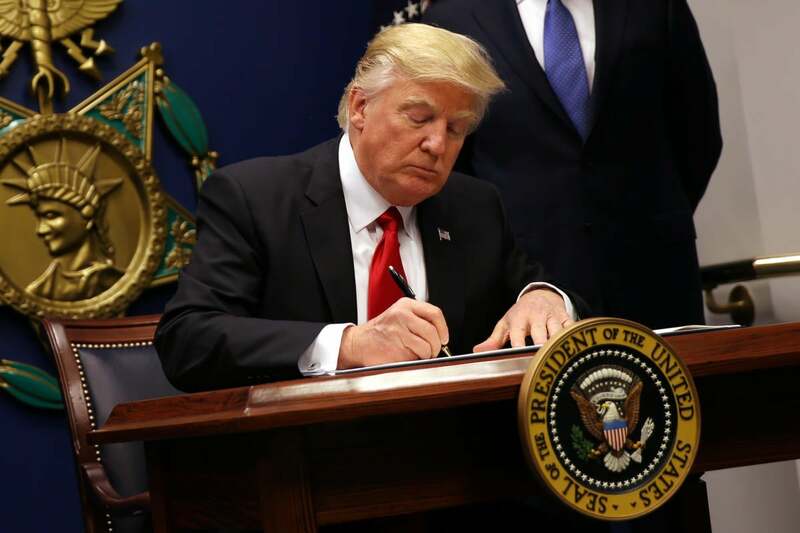 More than 100 tech firms banded together in submitting an amicus brief to a federal court expressing opposition to Trump's first attempt at a travel ban (which a court ultimately struck down). When word surfaced of a draft executive order revamping the H-1B visa program for skilled workers, it came as a jolt for companies that heavily rely on foreign talent for their staffing pipeline. "It scared us into thinking what sort of future do we have if the Trump administration is focusing on trying to close off the borders," said Norberto Salinas, director of government relations and senior counsel at Intel, one of the firms that joined in the amicus brief opposing the travel ban. At Intel, Salinas explained, hiring managers are "focusing on graduate students in STEM fields." "The majority of those students happen to be foreign nationals on student visas," Salinas said. "And so when we're going out there to look at the pool of available workers, the majority of them are foreign nationals. Once their student visa is done, they have to return to their home. What we'd like to do is to keep them here, because they are the best and the brightest. They're the ones that are innovating -- they're creating the next new products; they're helping us with the next generation of microprocessors, which drive and build innovation."